Observations, fotos & videos of Nest #32 & it*s territory can be posted & enjoyed here. Nest #32 used to be in a beautiful old Tree in a grassy field on a cliff overlooking some of the most beautiful sandstone rock formations of Hornby. 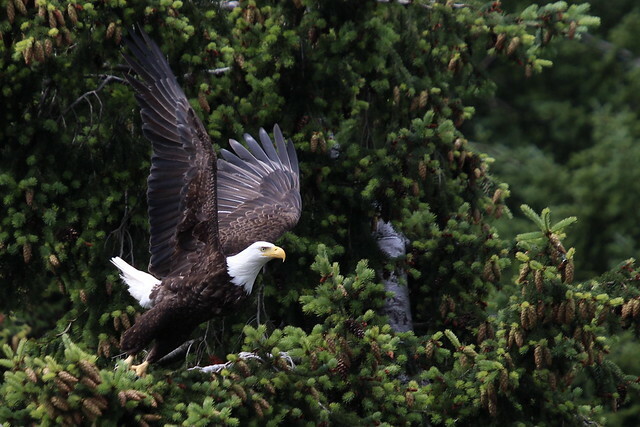 The people who live there have a hobby farm, & they very much enjoy their Eagles. But last year, the Nest was unused! Which was a huge surprise. 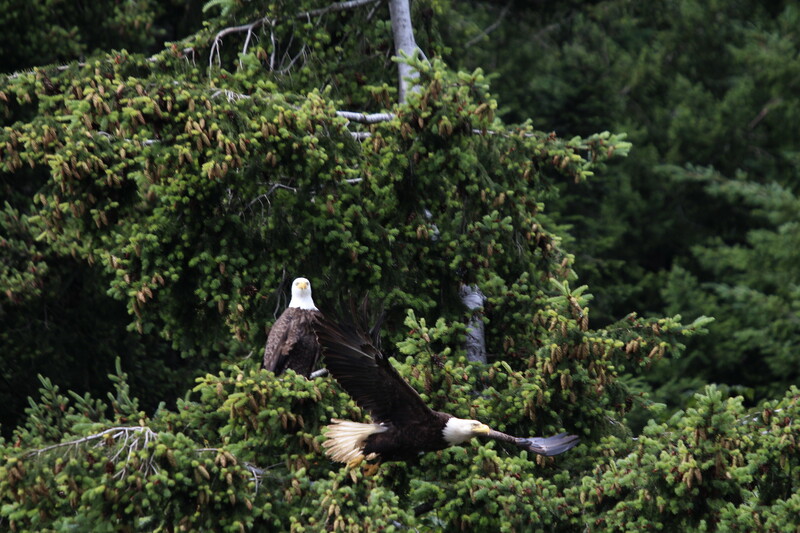 It seems the Eagle pair moved their Nest inland! 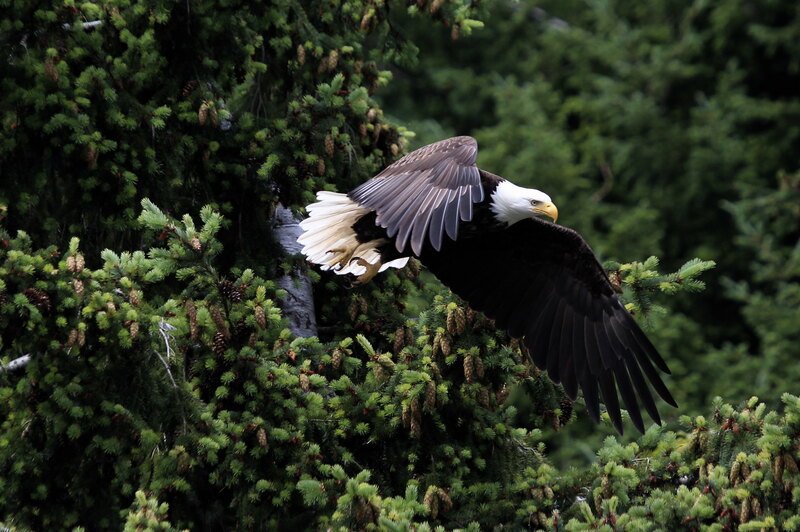 Read the first link below to see how wren discovered there was at least one Eaglet in this new Nest last year. Which Nest will they use this year? This is an excellent fishing area. 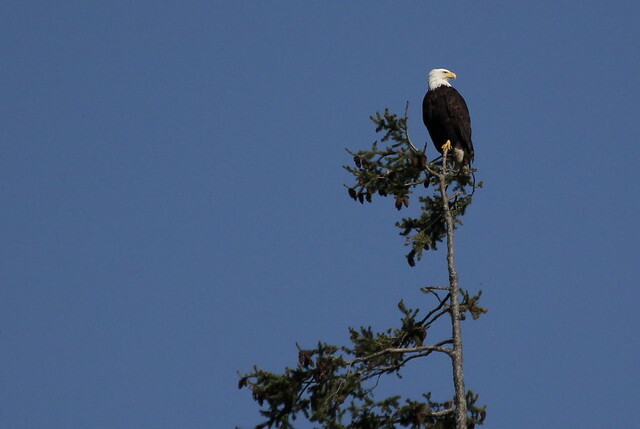 The Eagle pair can often be seen perched at Ford Cove, in the trees over the cabins & store, & near the dock there. i bet they keep an eye on people who have fished & are cleaning their fish & leaving scraps! 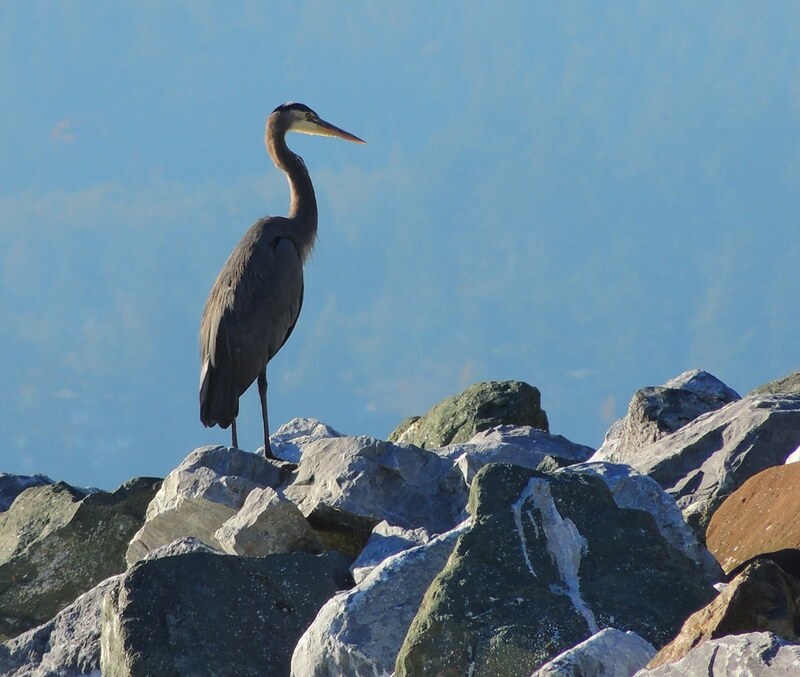 When you go down to Ford Cove, not only do you see Eagles, but there is always other wildlife & people life going on too. From the docks you see the cliffs that extend all the way to the ferry. These cause updrafts which Eagles of all ages & Turkey Vultures love to soar on! It is always an adventure to go to Ford Cove. To read about the 2012-2013 Season, click here. To read about the 2011 - 2012 Season, click here. Click Here to read about what happened in the 2010-2011 season. the story of Nest #32 - Ford Cove - 2009-2010 Season can be found here. 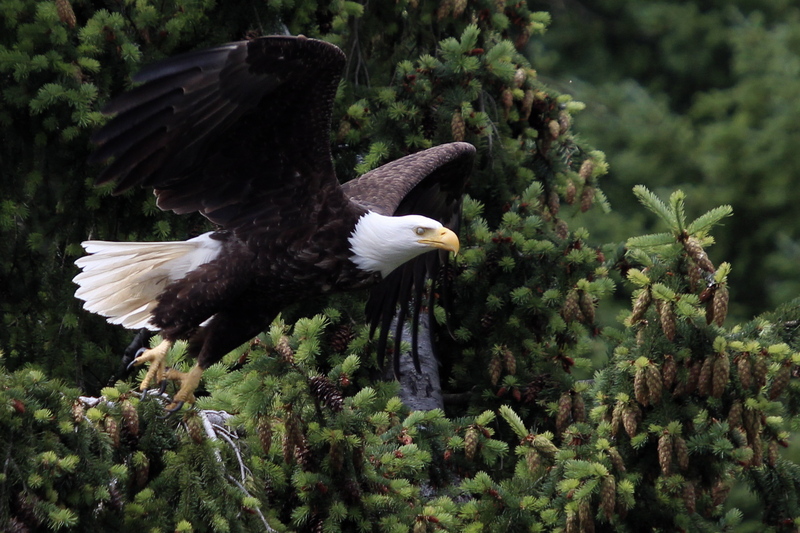 Click here to see wren*s beautiful map of the Eagle*s Nests of Hornby Island for the 2013 season. You can find this Nest on that map. 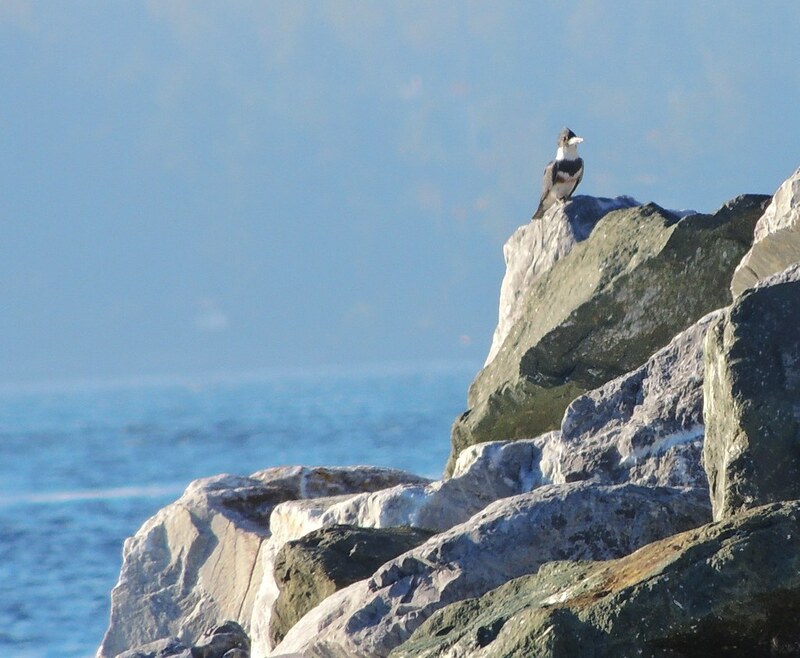 We were down at Ford Cove to see if there was anything to see there on this beautiful, sunny, warm october day. 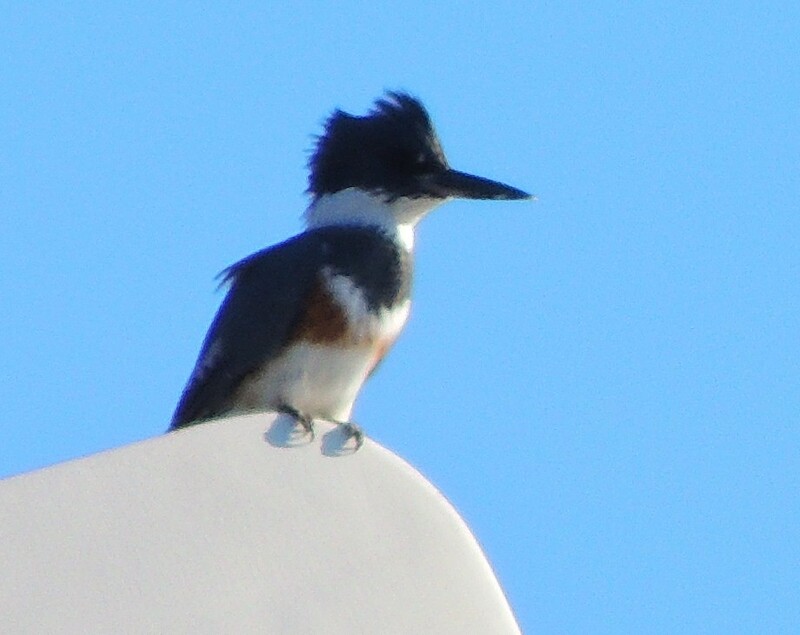 What caught my eye & ear the most this day was a pair of Kingfishers that were interacting together. They were chittering away, landing in different places, the other would come close & the first would fly off chittering, landing somewhere else. They moved very fast, but i attempted to capture them with my camera. There is a windmill at Ford Cove, that is to create power during outages. i have never seen it in operation yet, however. 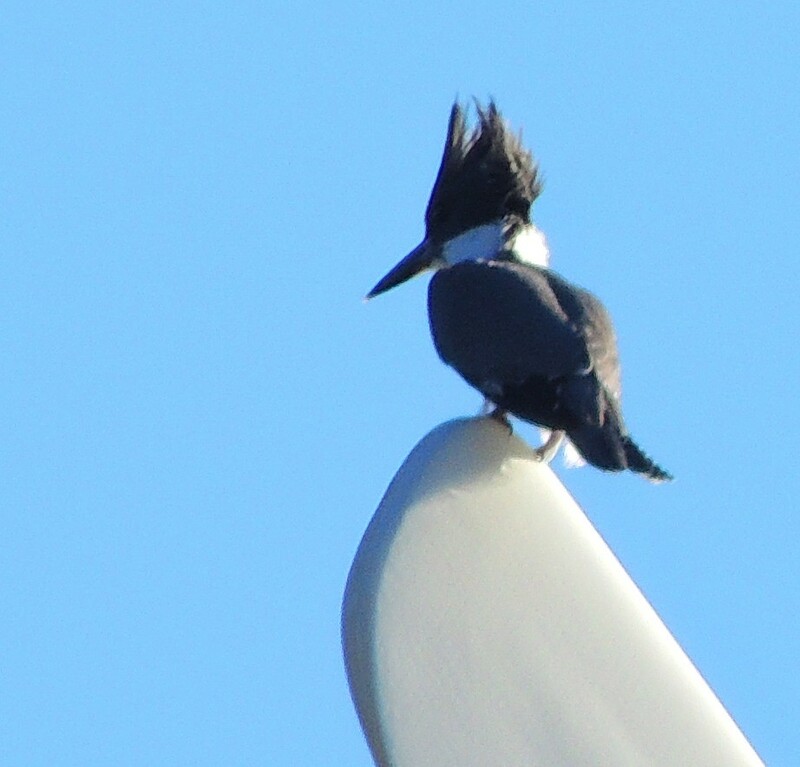 The Kingfishers were taking turns perching on the blades. 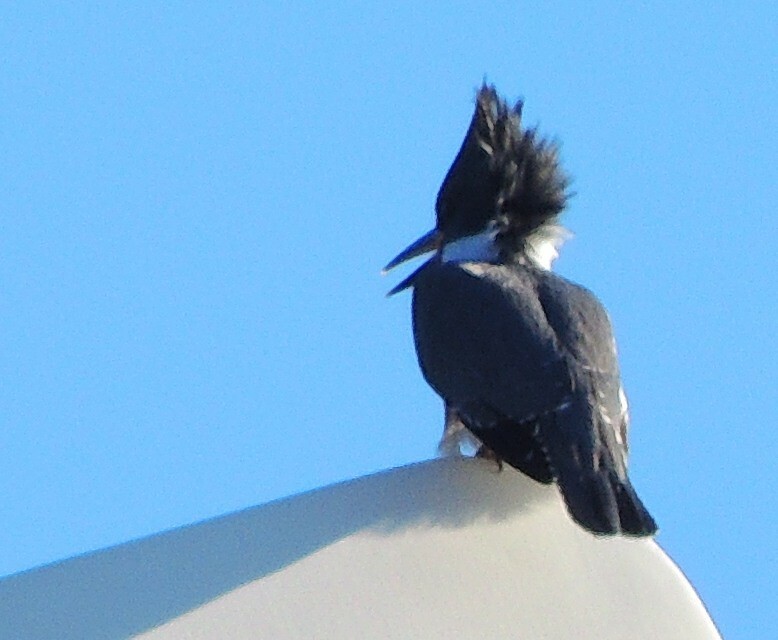 Look at the crazy hairdo! Okay, now this one is a female, they have the red band across their chests like this. Looks like she may have brown eyes. Here is a female again. 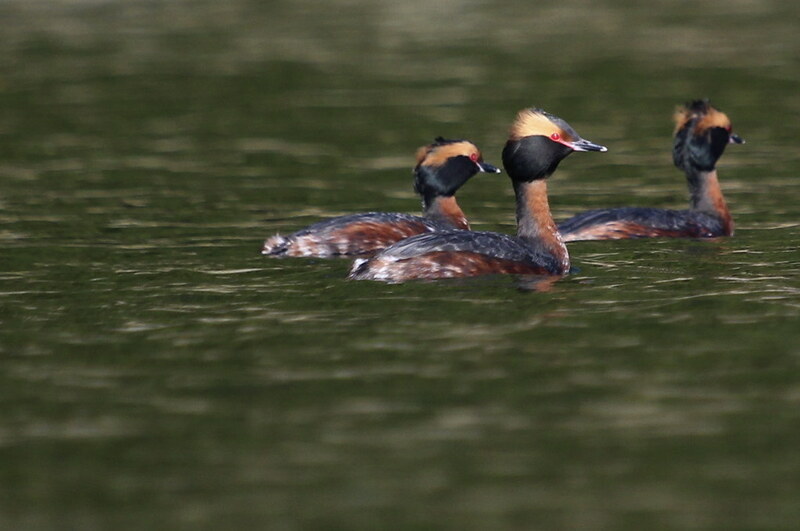 i have no idea if they were both females, or a mated pair, or perhaps youngsters goofing around. They sure were fun to watch & listen to though! 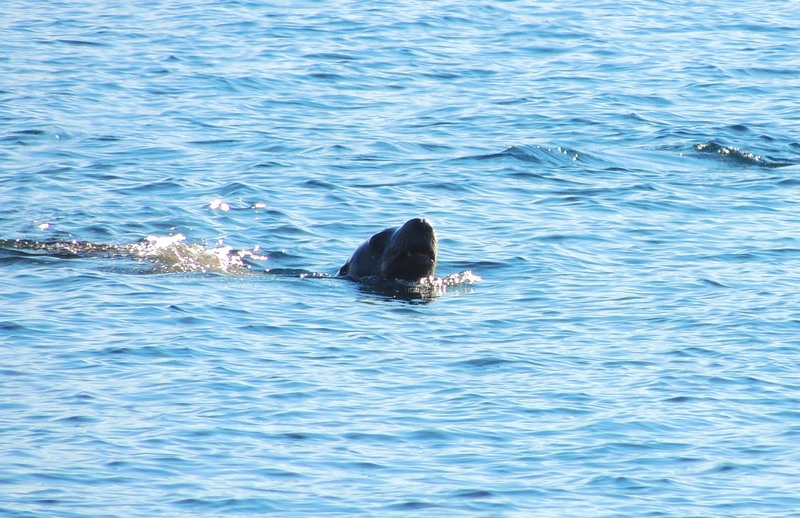 There were Sea Lions swimming past! They are challenging to catch. You never know where they are going to pop up, & by the time they catch your eye & you aim your camera they are under again. 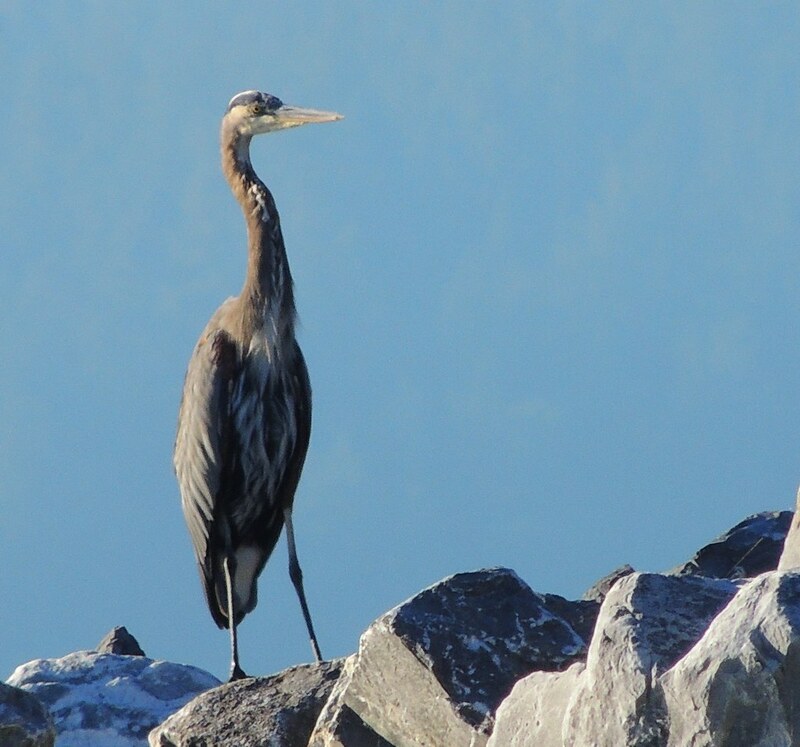 There was also a Great Blue Heron, as there often is, perched on the big rocks of the break water. This angle shows the white stripe on top of the head, & the lovely feathering that goes all the way from under the chin to the white patch under the tail. 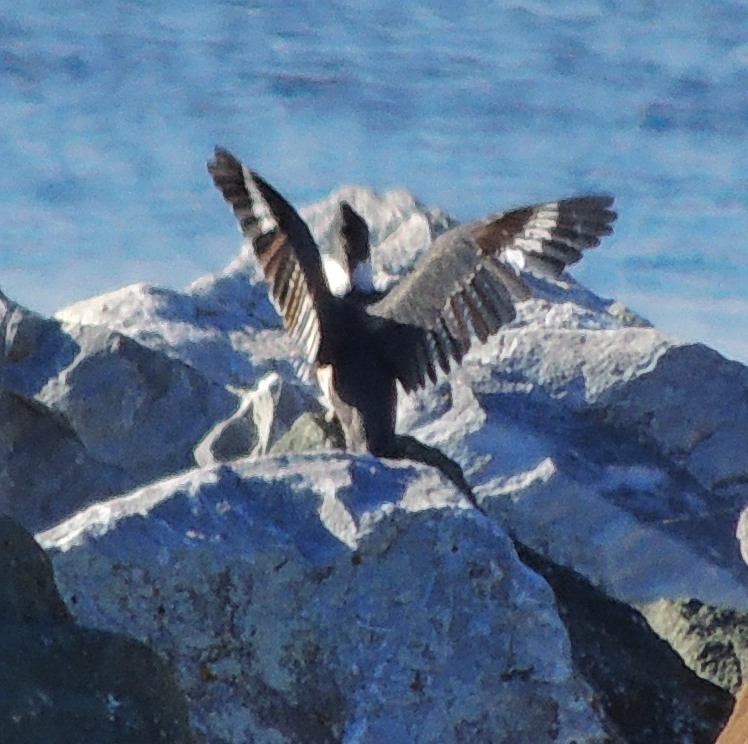 Here is one of the Kingfishers on the breakwater now! You can see she is a female. Now here are both together, for a size comparison. Oh Booni, these photos are amazing. 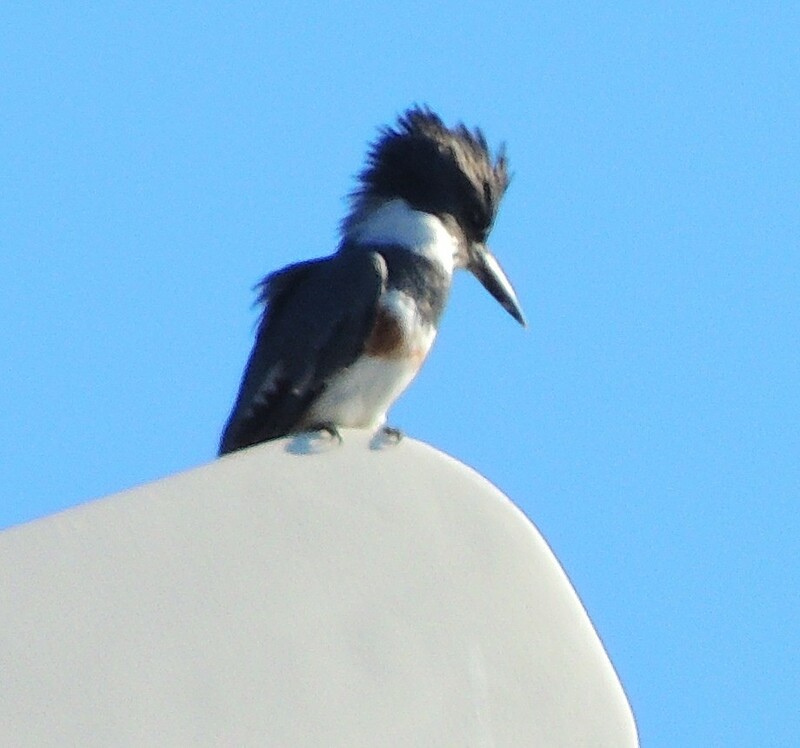 Love the Don King hairdos on the kingfishers! Late monday, just before dark, i got a call about a Canada Goose dragging their left wing down at Ford Cove. This was the second or third day in a row this Goose had been spotted. It was too late to do anything that evening, & i had a booked solid day the next day unfortunately, so it was getting towards evening again when i headed down there to meet Gustival to try to find this unfortunate Goose. 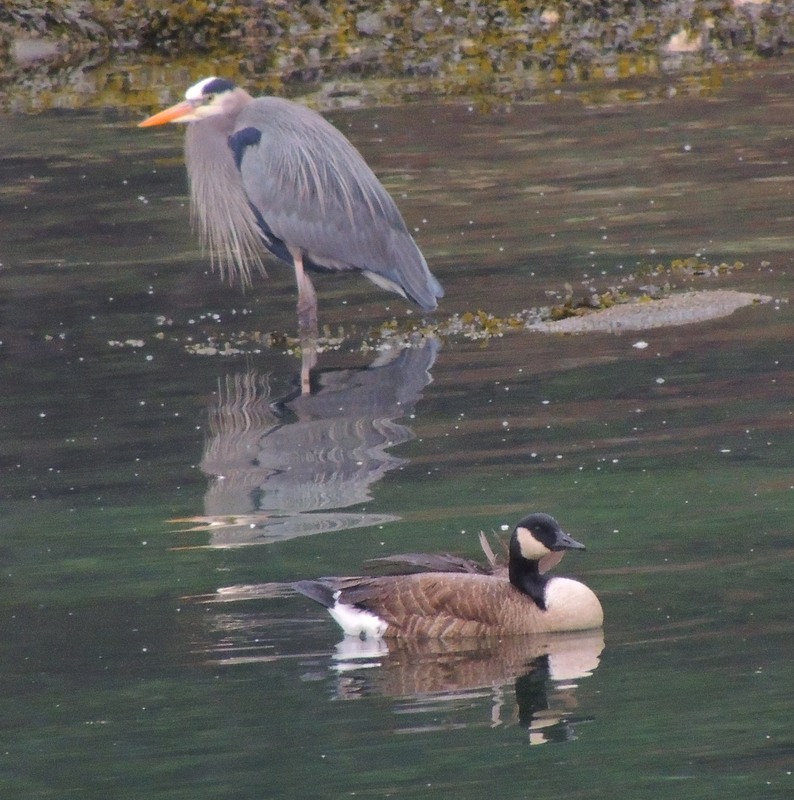 At first we had trouble spotting the Goose, but then someone on the dock pointed them out, hanging out near a point in the bay, next to a Great Blue Heron. i took some fotos to document the situation. You can see something is just not right with the way the left side looks. Notice all those feathers poking out at odd angles, & the kind of hollow look to the side. Again, compare the left & right sides. 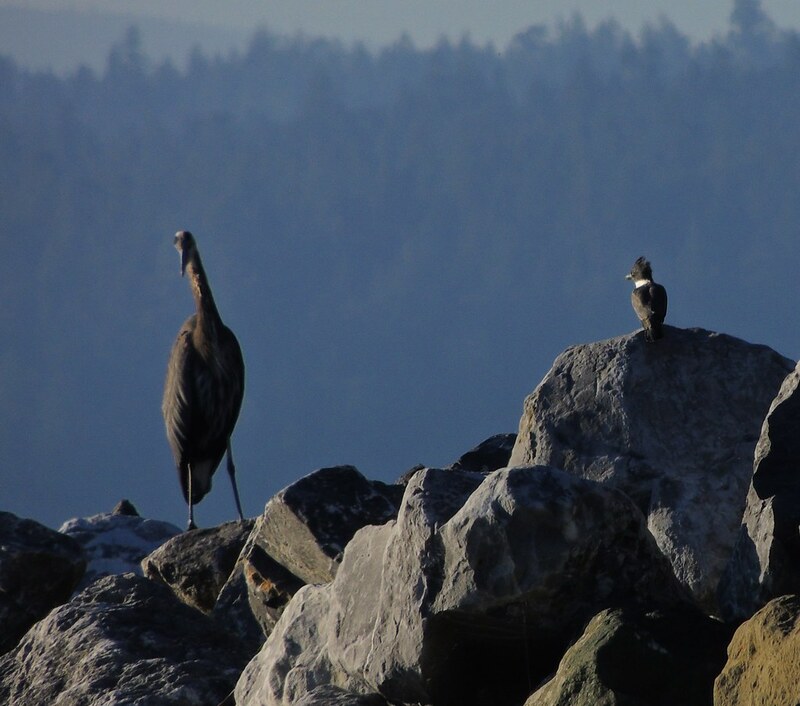 Here they are with the Great Blue Heron. The feathers on the left side should not look like that. This was a tough capture. It was late in the day, raining & getting dark. 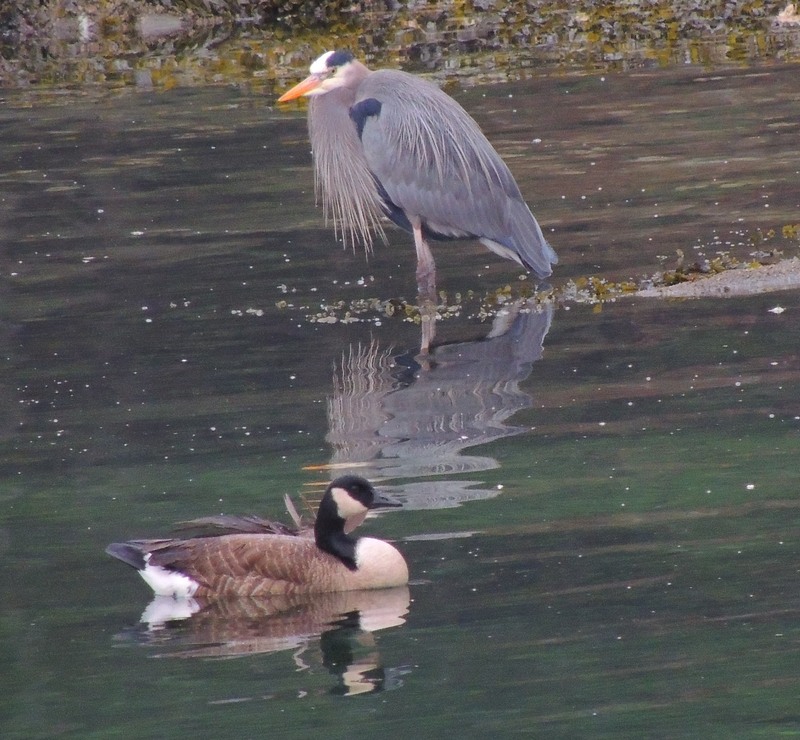 i was hoping to get the Goose on the last ferry off Hornby that day, 6pm. The beach is terrible to walk on this time of year. & this beach was mostly large round rolling slippery rocks. We were trying to corner the Goose, to keep them on land, but they kept going to water. 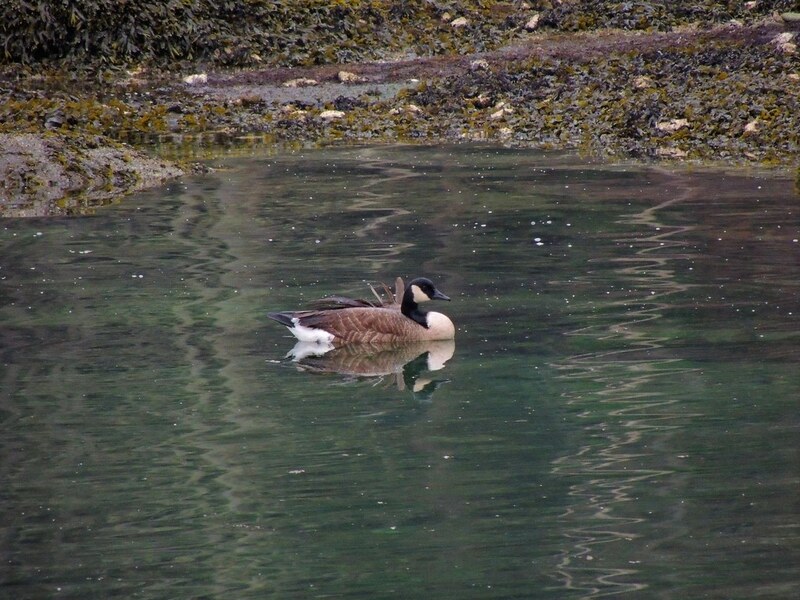 & the Goose could swim way faster than we could scramble over the slippery rocks. So Gustival had the brilliant idea to ask Louis, the Orca kayaker, to help us. He would keep herding the Goose back to land while we tried to catch up & surround the Goose to capture. 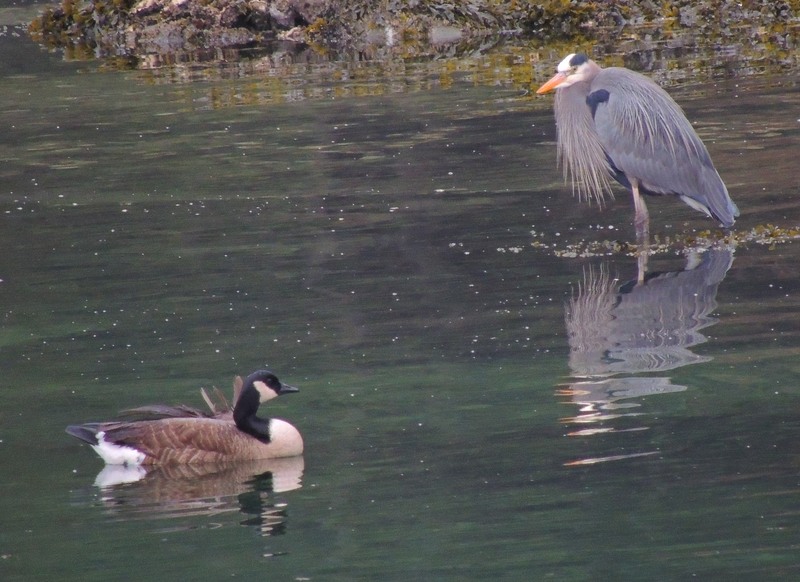 But the Goose & the kayaker could go way faster than we could catch up to them on the beach. We had the Goose cornered against rock at one point & Gustival was distracting him while i reached from above & tried to net him. But he got away again. It was painful to see the Goose walk on land. The wing was terribly broken, a compound fracture, with a big wing bone sticking out. The wing was actually twisted upside down & inside out, & dragging on the beach. The kayaker couldn*t take the Goose torture any longer, but we had to catch them & get them into help!, not leave them there to suffer longer. So we made a real run for him this time, throwing safety aside. We lucked out that the Goose headed inland towards a steep cliff. But he found a nice hidey hole where i couldn*t reach in with the net or my arms. But Gustival found a hole to reach in & pull the Goose out. He honked at us til i covered his head in a towel. Gustival wrapped the Goose in the towel with the head covered & carried him under one arm. The Goose would nibble at the towel once in a while, but was otherwise calm. The kayaker went looking for Orcas, while we trudged the long slippery way back to the parking lot & the waiting kennel with a towel in the bottom & the door open & ready. The Goose went in without a fight & we used the towel to cover the window. Looking at the clock, too late for the last ferry. So Maj suggested storing the kennel in my cabin covered with the heat on, warm dark & quiet, for the night. The smell in the cabin was just lovely. i went in next morning & there was the same smell, & i checked to see that the Goose was still alive. i arranged with a friend to take the kennel to the 8am ferry, then Mike & Sherry from Denman drove to Buckley Bay, then Allison from MARS guided Sherry with the kennel to MARS. The Goose was examined by Reg & euthanized right away. 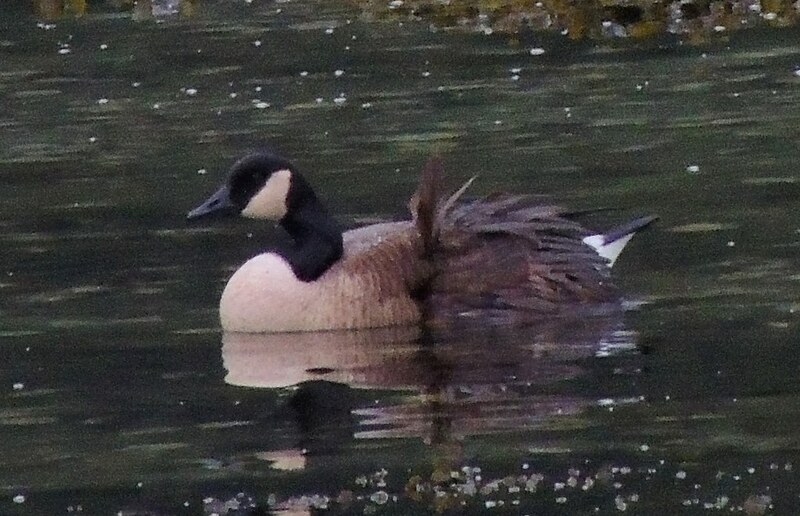 But at least this unfortunate Canada Goose didn*t have to suffer a long slow death on the water. You are a Hero for the goose! Saved it a long painful death! Gosh, what a difficult situation! Kudos for your hard work, Booni! Thank-you so much for helping catch the goose Booni. It was hard to see it injured and was good to have it captured. It was a hard scramble over that beach for sure! I am so glad that I got to help it. It is hard to know that it was too injured to be healed but it is good that it did not have to suffer any longer. I will never forget the privilege of holding such a beautiful animal. It had gorgeous dark eyes. I have to admit I fell in love with it when I held it, it was so calm and trusting and I was so surprised when did not try to bite me as I reached in to the hiding place it found and gently lifted it out. We live surrounded by such beauty and life and we each have to do our best to care for it. Thank-you Gustival & Booni. Poor Goose. Not suffering anymore is a blessing, he was probably in a lot of pain. 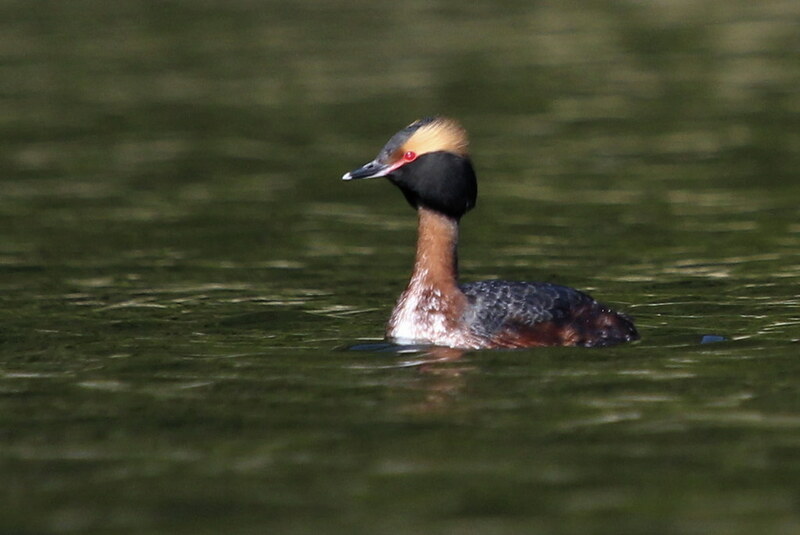 I went for a paddle through this nest's territory two weeks ago, on April 13. On my way out, I met one of the island birders, who had just finished her monthly seabird count, and let me know that she had seen some Horned Grebes in breeding plumage nearby! 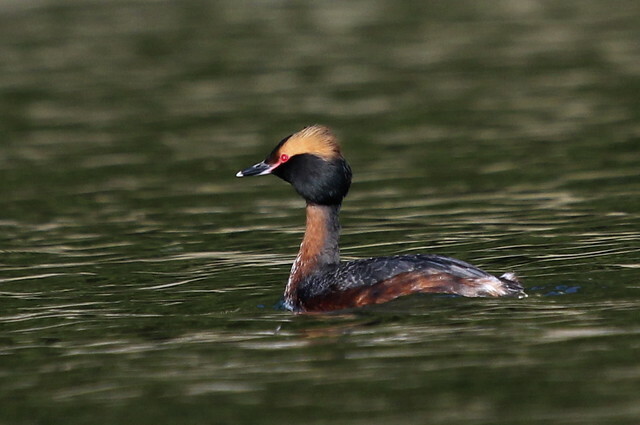 I was really excited about that; I've had pretty good luck photographing Horned Grebes in the winter, but in spring as they change garb they become more skittish and are difficult to approach. I had had a fleeting view of a pair of them the day before; I showed them in this post, together with a view of a grebe in winter plumage. Thanks to my birding Elder, my luck turned! 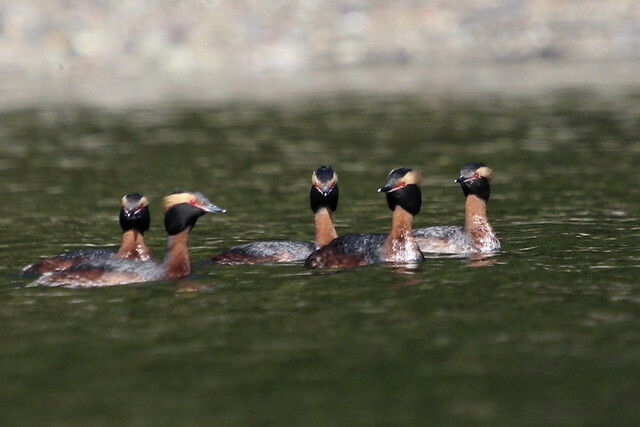 On the far side of Ford Cove, I spotted a flock of FIVE Horned Grebes, and what a sight they were! 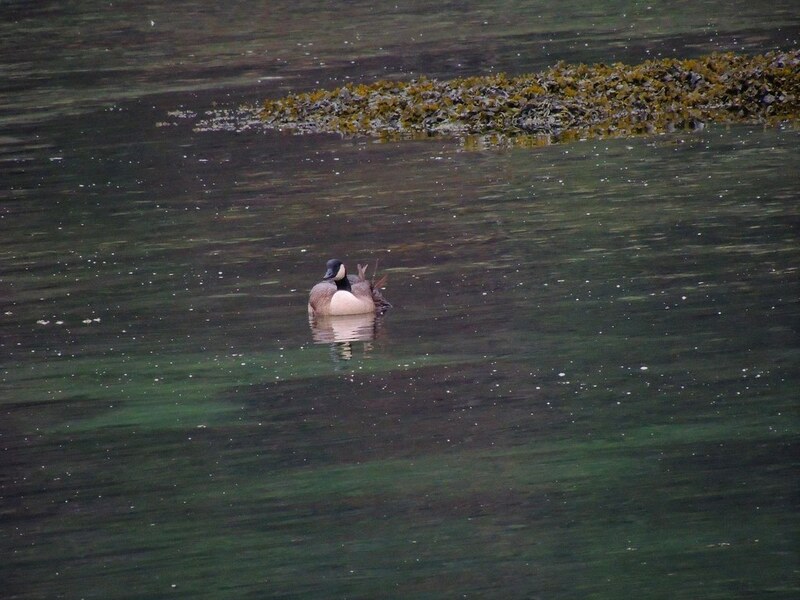 Seeing them in a flock was a surprise, because in winter they seem to keep to themselves, or at most to swim about in pairs. 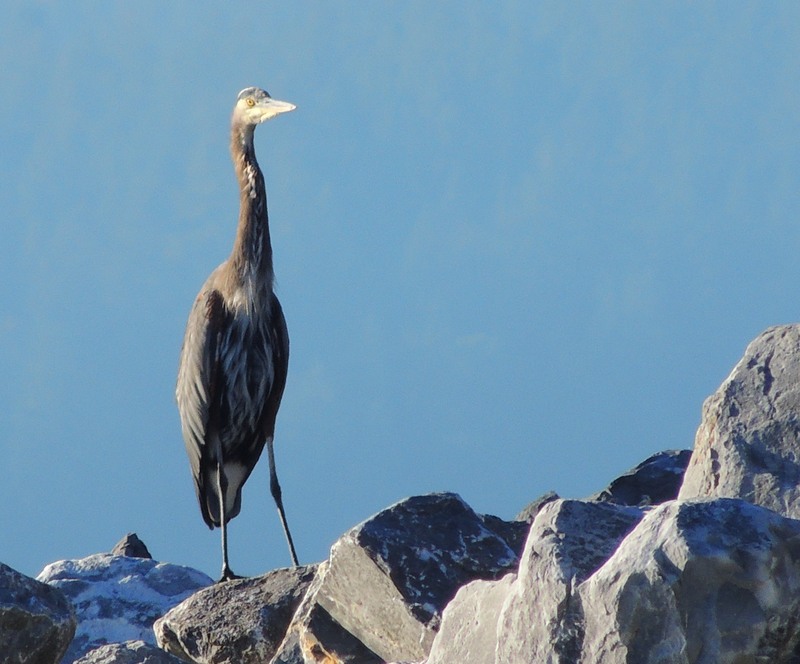 I moved upwind and with the sun at my back so I could drift slowly and silently toward them. Here we see one from the back... Pretty amazing hairdo. 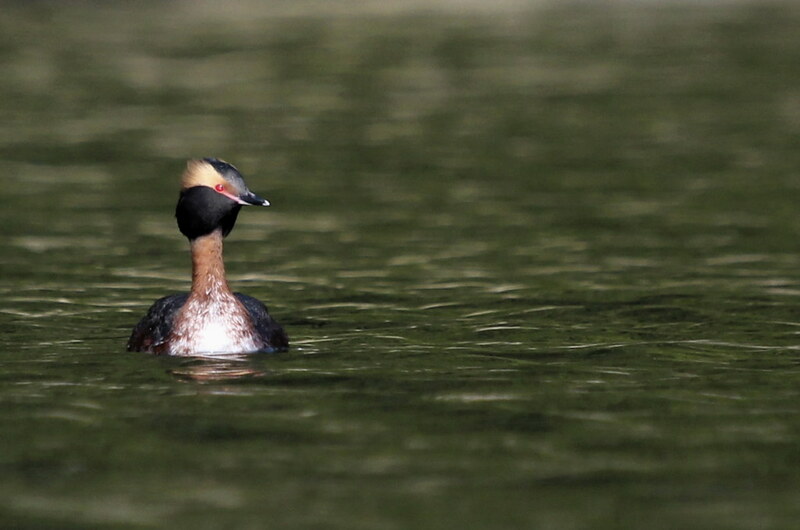 Then I paddled on and approached the old Nest 32, which was not in use last year. There was an eagle perched very close to it! 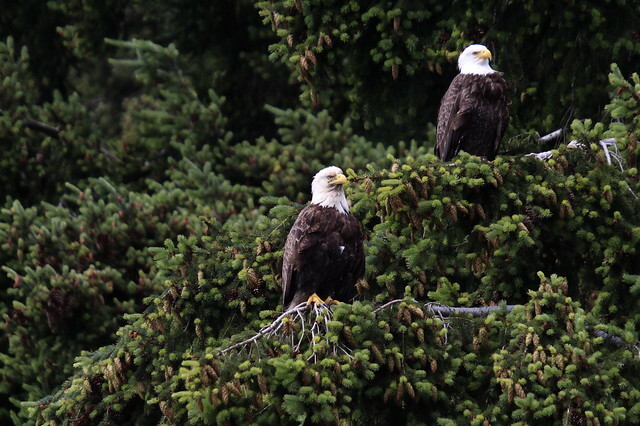 I was wondering if that meant that the pair had returned to their old nest. As I approached it, I was struck by how clean and tidy it looked. So, like a human being, I projected this to mean that it was being cared for. But then I caught myself. Maybe the nest seems tidy because it's all the same colour... the colour of dead branches. Nothing added for over a year. Sure enough, click on the picture to look at the larger size.. there is GRASS growing inside the nest! Nobody is using it right now, that's for sure! 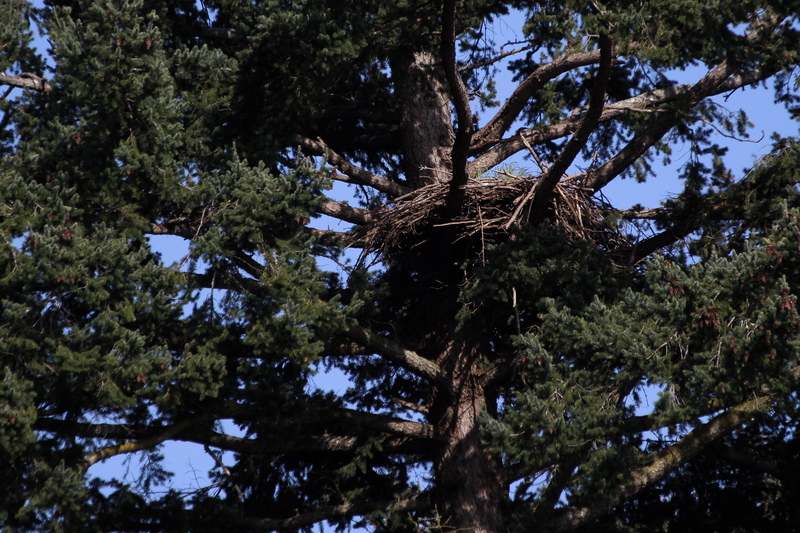 The new nest is further in the back, and no doubt that eagle could see it from where he or she was perched. But from the water I cannot see it. 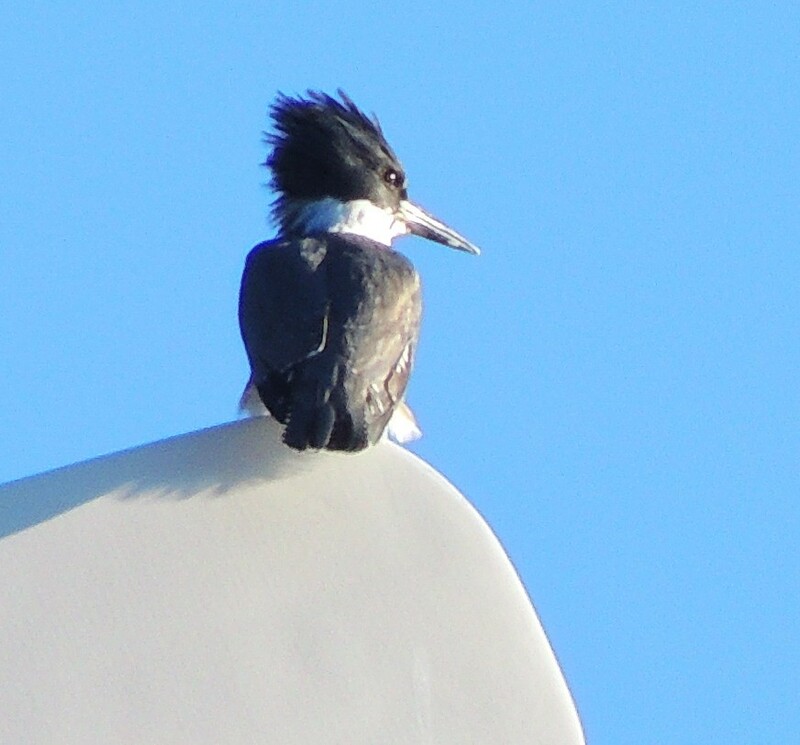 I still don't know the status of the Ford Cove nest this year. I'll have to ask the neighbours what they think. Meanwhile, on June 11 I went for a little paddle with Gmadeb. There was a southeasterly breeze blowing so we went north, below the escarpment, in an area whose occupancy is unknown. 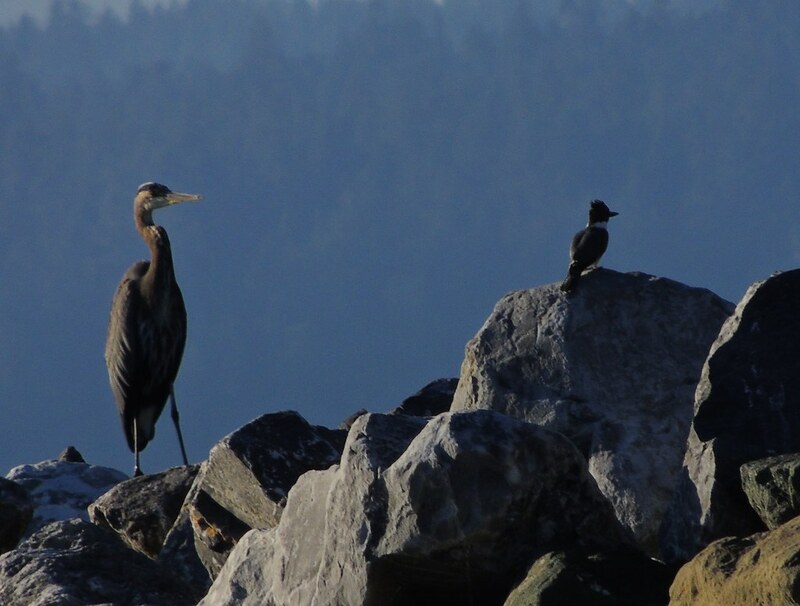 There are often eagles perching along that way; I'm familiar with the ones who fish closer to Shingle Spit, but this pair was just a few minutes out of Ford Cove, well south of Windy Point. 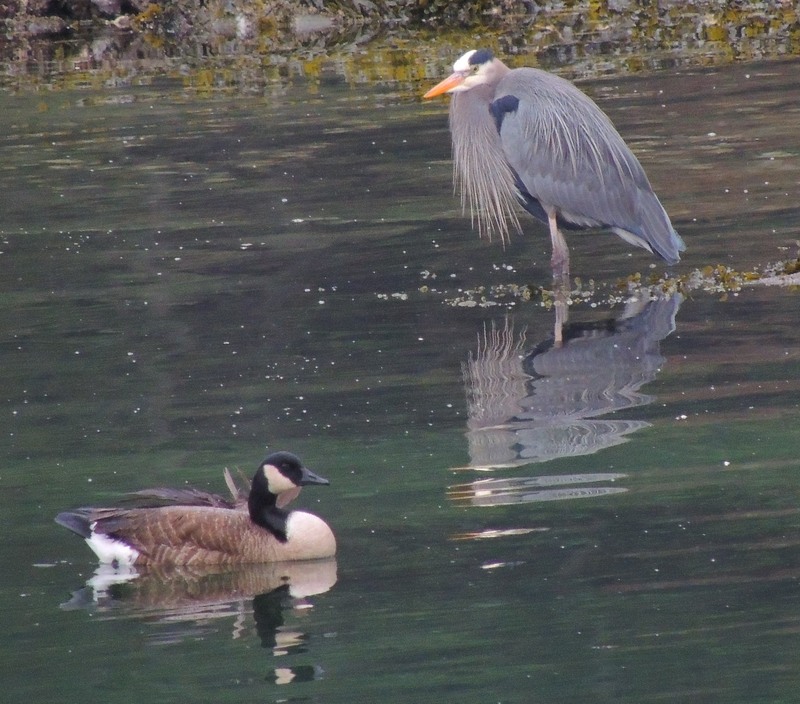 I sure could imagine them as a breeding pair, he above, a little smaller, with nice mutton chops; she below, a little bigger, with stained head feathers. I'm not sure at what point this becomes circular logic, but does this mean she has a nest to dig into? Both have nice bulging crops! 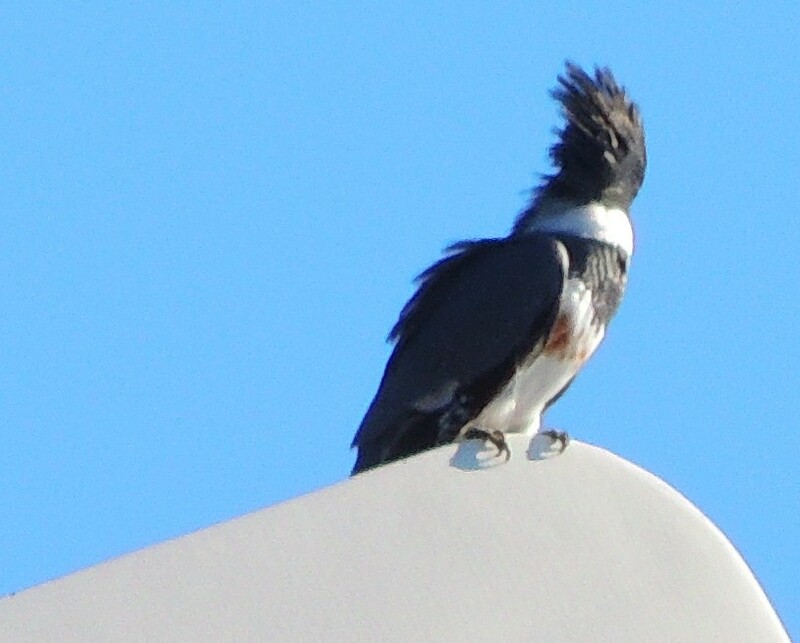 Their feathers are also ruffled by the breeze, so it makes them look portlier. She takes off first... We've drifted too close. 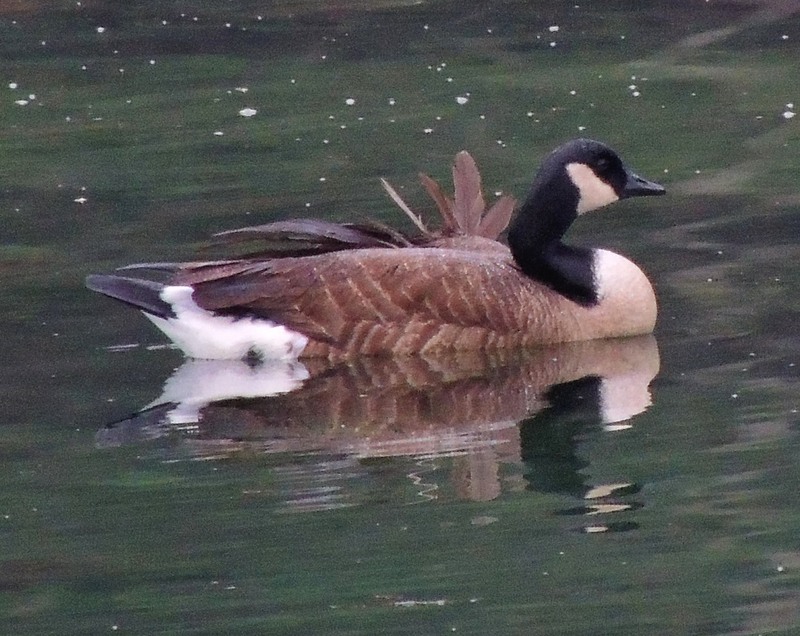 The closed nictitating membrane is just a blink: these last three photos were taken rapid-fire.